Ten cameras recorded the BO 105 helicopter from various angles. Blade tip vortices are visible as dark lines during a full rotation of the main rotor. The engine exhaust flows are perceptible as a noisy area trailing the helicopter. The tail rotor's vortex system is also visible (black, circular lines on the tail rotor). The helicopter is currently performing a rocking manoeuvre. The Göttingen-based researchers employed a novel technique to visualise the rotor blade vortices, using the loose scree littering the quarry as a background for their measurement method. DLR BO 105 research helicopter in flight above the lake at the base of the quarry. 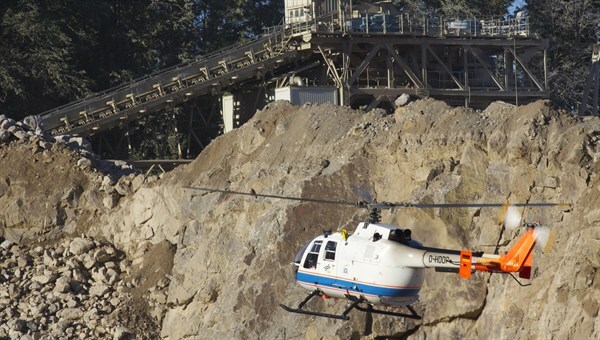 A quarry is a hazardous place for a helicopter. 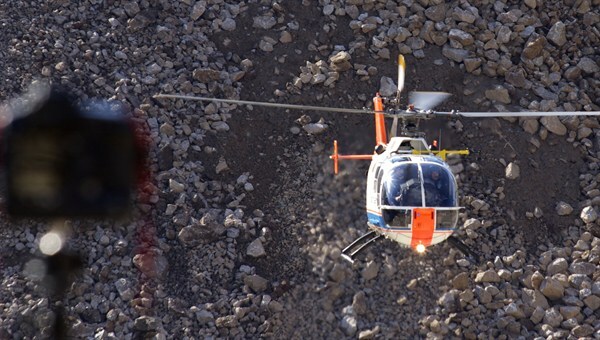 The helicopter was in vertical ascent just as the images were shot. The vortices are seen as dark lines, with a maximum of one full rotation being visible. The helicopter engine exhaust flow is also visible as a noisy region behind the helicopter. The confined space and manoeuvres so close to the ground tested the skill of the DLR test pilots Sebastian Soffner and Uwe Göhmann. In places, they were asked to perform rocking manoeuvres barely ten metres above the ground. 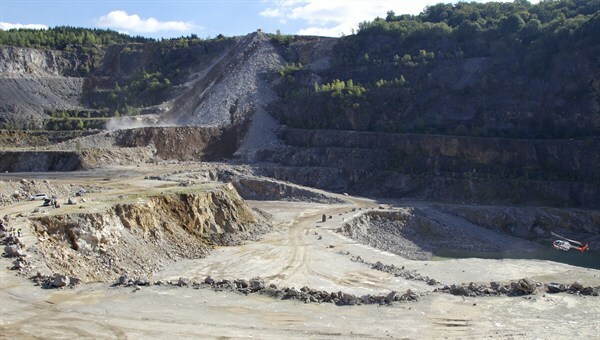 The Winterberg limestone quarry near Seesen, owned by Fels-Werke GmbH, was the venue for the most recent tests. Tight coordination between helicopter manoeuvres and camera shots was imperative. 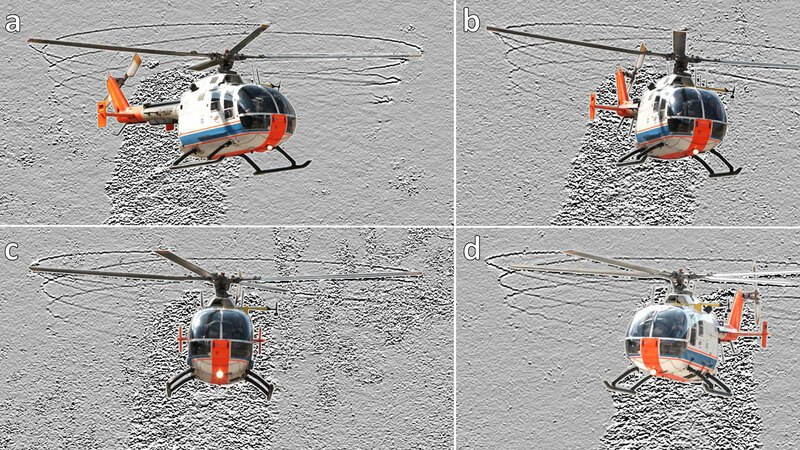 Researchers from the German Aerospace Center (Deutsches Zentrum für Luft- und Raumfahrt; DLR) based at Göttingen and Braunschweig have succeeded for the first time in visualising the main cause of what makes helicopters so noisy while in the air. 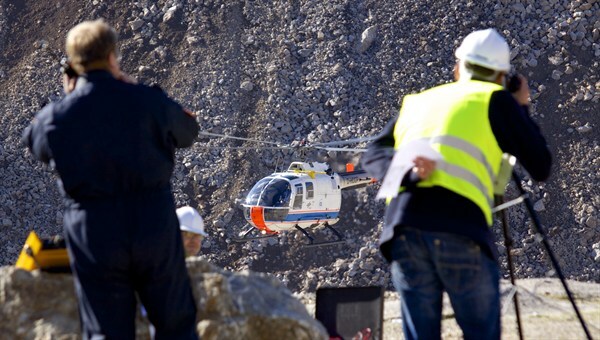 To do this, they conducted at times daring in-flight experiments – most recently in a quarry in the Harz region. The knowledge they acquired will open up opportunities to make future helicopters much quieter. Helicopters can perform vertical take-offs and landings thanks to their main rotor, but this is also the reason why they are so noisy in flight. "Almost everything heard from a helicopter is aerodynamic noise. 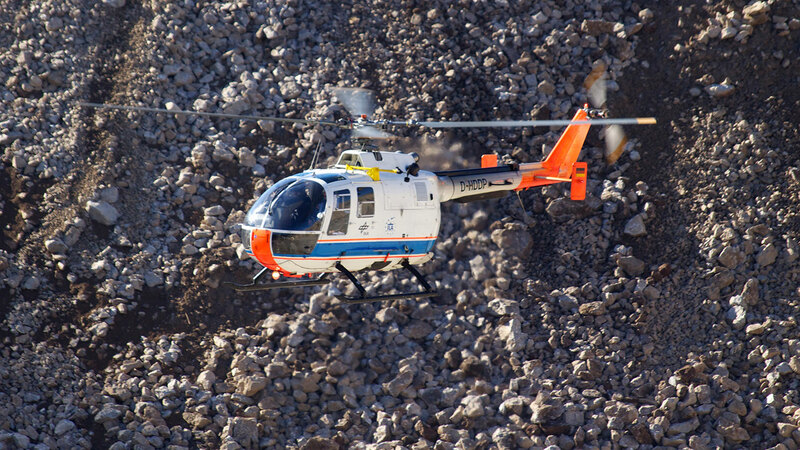 A large proportion of that is caused by what are known as blade tip vortices," says Markus Raffel, Head of the Helicopter Department at DLR Göttingen. Blade tip vortices form at the outermost end of a rotor blade; a zone of reduced pressure forms above the blade and a region of increased pressure forms below the blade. As the air flows around the blade tip to reduce the pressure difference, a concentrated vortex is created behind the blade tip. "The noise comes from the vortex behind a rotor blade interacting with the following rotor blade," explains André Bauknecht, leader of the current experiments. 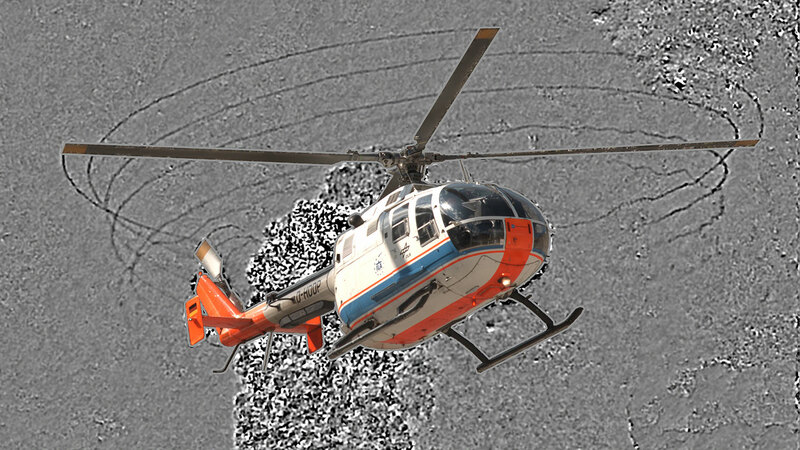 These vortices are not just responsible for the typically 'carpet beater' noise; they also produce vibration within the helicopter and make the ride less comfortable for passengers. The researchers employed a well-known phenomenon to conduct their tests. On hot summer days, the air above some sections of a road starts to shimmer. This is due to fluctuations in the air density causing refraction of light, which is visible as striations when perceived against a suitable background. Raffel and his colleagues exploited this insight to develop what they call the Background Oriented Schlieren Method (BOS), a system now used in aerodynamic test facilities throughout the world. Last year, the DLR scientists conducted a series of unique and at times daring experiments to test the new measurement method in flight. The Göttingen-based researchers employed a novel technique, using natural background areas to visualise the rotor vortices. "A suitable background must be as finely textured and uniform as possible – so we investigated where nature can offer this kind of surface," says Bauknecht. During one test, a Swiss Air Force Cougar helicopter manoeuvred in front of a rocky background in the Alps. This yielded a successful world premiere – for the first time, images of a helicopter in flight produced a sufficiently precise visualisation of rotor blade vortices to enable the acquisition of scientific knowledge. During other tests, the DLR BO 105 research helicopter flew over fields and meadows near Salzgitter and Braunschweig, while researchers in a microlight aircraft flying above the helicopter acquired images. 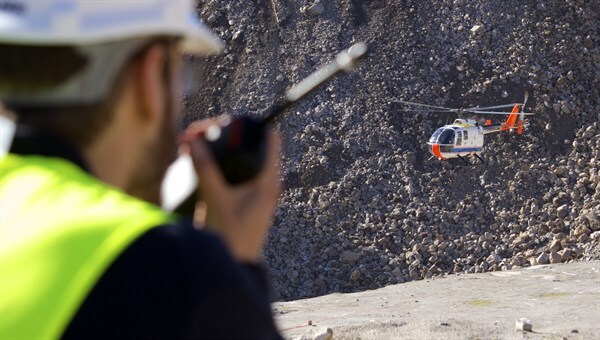 The latest experiment took place just recently; the BO 105 descended into a quarry in the Harz region – a hazardous environment for a helicopter. The confined space and manoeuvres so close to the ground tested the skill of the DLR test pilots. In places, they were asked to perform rocking manoeuvres barely ten metres above the ground while the loose scree littering the excavated rock face served as a backdrop. But the effort was rewarded; ten cameras set up at various angles yielded images of such quality that, for the very first time, a substantial proportion of an in-flight helicopter's rotor blade vortices could be visualised in three dimensions. The Winterberg limestone quarry owned by Fels-Werke GmbH near Seesen was the venue for the tests. The next round of flight tests will involve fitting helicopters with measurement equipment, enabling a direct comparison between the vortices recorded and the control inputs from the pilot. It is already evident that the DLR measurement technology has the potential to become an important tool for industry. Altering the blade shape or modifying the rotor controls could enable a reduction in blade tip vortices and their interaction with the blades trailing behind. 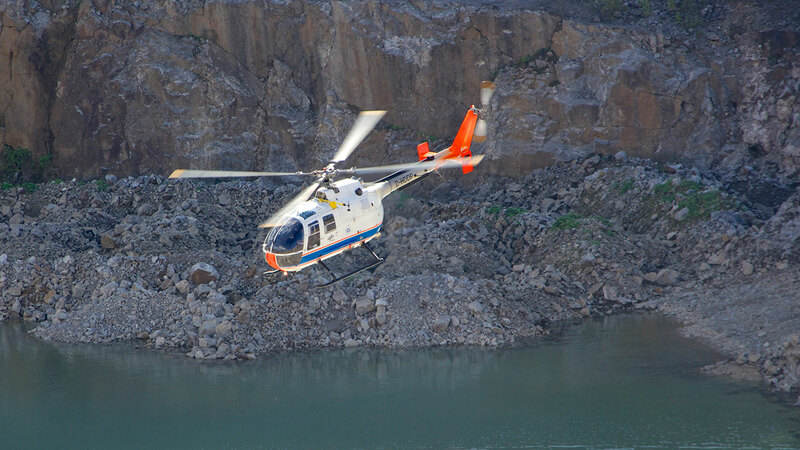 "This would help helicopter manufacturers to compare various rotor blades under realistic conditions and to select the quieter option," says Bauknecht. As a result, there will be new opportunities to make future helicopters quieter and more comfortable.